Dexter Daily: 3 Days Left! Only 3 days left until Dexter Season 7 begins production. The cast of the show has the script of the season premiere episode, which will be called "Are You...?". According to sources there are already some settings for the outdoor shootings of the first episode in L.A. If you spot Dexter filming in L.A. send us your photos or info, at dexternewsblog@gmail.com. Aw, I love your choice of pictures which accompany the posts! 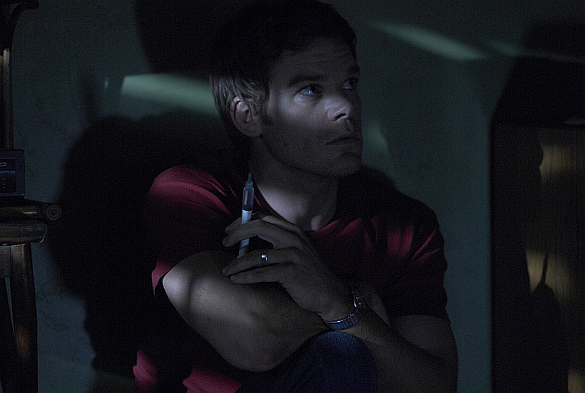 Here is Dexter hiding out in the shadows with his syringe. But for how much longer can he remain 'hidden away' ???? No more, cause his sister saw him kill Travis! haha yes. i can't wait to see what debra says about that next season. I don't always kill serial killers. But when I do I make sure that my sister barges in at the most inoppertune time. Watch it :| Remember what happened to Miguel. @Patrick .. you are a dumbass. He is not the Dos Equis Man..Dexter isn't real, but the dos equis man is my grandpa and i take offense to your post. you should be banned from this website. I remember. That stain just wouldn't come out.